Linux users take note — in most cases, you can get Maxima and wxMaxima without having to visit these sites, by using your favorite package management tool (yum or apt, depending on your distribution). Details below. If you are running Windows, visit Maxima (SourceForge) and download and run the listed Windows installation .exe and most everything will be automatic (the Windows package bundles Maxima with wxMaxima and other necessities). Be sure to select the wxMaxima option that is offered during the installation. When you first run wxMaxima (an icon is placed on your desktop by default), your firewall software may complain that a socket is being opened. This is a local socket that wxMaxima (the user-friendly graphical front end) uses to communicate with Maxima (the computation engine), it is not an attempt to take over your computer or communicate your personal secrets to ruthless Russian mobsters. Suspend your paranoia and allow the socket to be created. I run Fedora and I have installed Maxima and wxMaxima multiple times recently, so the instructions below will very likely work without change for anyone running a recent version of Fedora and similar distributions. Other distributions will need to work out variations on this installation procedure to suit differing package management programs. Open a root shell. Below, this root shell is indicated by a '#' symbol at the left of each entered command. Now change to a normal user shell, designated by '$' at the left. In 99% of cases, upon entering the last command above, you will see the wxMaxima graphic interface. To avoid having to open a shell each time you run wxMaxima, drop this icon onto your desktop. I don't run these Linux distributions, so this is only an educated guess. Follow the instructions above, but replace the command "yum" with "apt-get". Chances are everything else will work the same, and if not, tell me. A new convention. In these instructions, your entries to wxMaxima will appear in blue, wxMaxima's (and Maxima's) replies will appear in normal black text. For Windows systems, place this font in the directory \Windows\Fonts. For Linux, place it in /usr/share/fonts (there may be some distribution-dependent variations in this location). Next, for all platforms, run wxMaxima and go to the menu item "Edit ... Configure ... Style tab", select "Use Greek Font", then click the "Greek" button, navigate to and select the font you have just installed. The results shown above indicate success. If your typed strings reappear in the output unchanged, something went wrong — go over the instructions above and repeat any steps you missed. It is my fervent hope that from this point onward, the instructions will correspond to readers' experience without reference to too many platform-specific distinctions. I have a Windows version and a Linux version of wxMaxima running side by side, so I should be able to detect the more obvious kinds of variations. I hope I don't find too many. 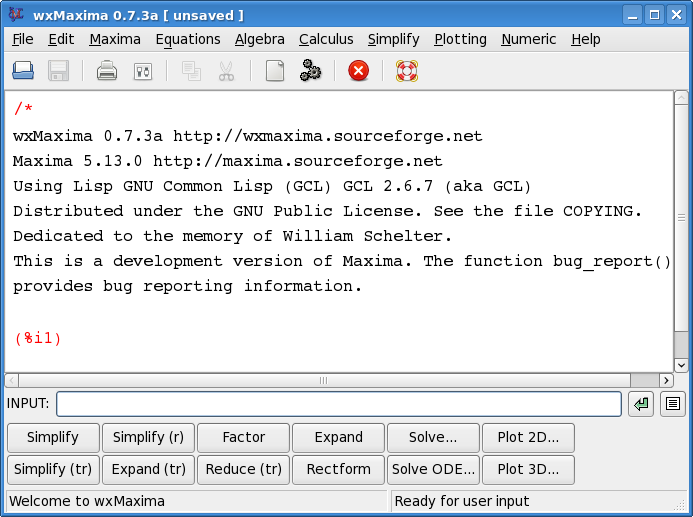 The designer of wxMaxima has adopted the convention that user entries should be typed in the entry window at the bottom of the display, at which point they are communicated to Maxima (strictly speaking, a separate running program) and Maxima's replies will appear in the large central window. First, notice whether or not your entry produces this result. One possible problem that might come up is that wxMaxima (the user-friendly front end) automatically produces a matching right parenthesis when you type a left parenthesis. This is a nice, time-saving feature, but it takes some adjustment at first. This feature can be turned off in wxMaxima's preferences dialog (Edit ... Configure ... deselect "Match parenthesis in text controls") if it makes you completely crazy. Second, wxMaxima automatically provides the semicolon at the end of the entry, you don't need to type this character. Third, if anything goes wrong at this point, if the result on your system doesn't match up with what is shown above, carefully go over the installation instructions again. Notice that this example supports the assertion that the number of orderings for any N objects is equal to N!. I avoided listing the complete results for permutations beyond 3 for a reason you will grasp if you list them yourself. This example shows that 99 is composite — it equals 3 * 3 * 11. The numbers 3 and 11 are said to be the prime factors of 99. And 101 is prime, so its only factor is itself. There is a function in Maxima called "primep(x)" that tests the primality of x and returns true if x is prime. One final note. In formal mathematical notation, for two adjacent numbers or variables with a space between them, multiplication is implied, so "32 11" means "3 * 3 * 11". Maxima will normally display equations with implied multiplication, but the user cannot enter equations this way — in user entries, one must always explicitly specify multiplication using "*".